Several employees have accused three state-owned companies of firing opposition supporters for participating in anti-government protests. Since March 1, at least four employees of State Electric Company Limited (STELCO) and one from Malé Water and Sewerage Company (MSWC) were dismissed, and at least five were suspended from Maldives Ports Limited (MPL). The opposition Maldivian Democratic Party (MDP) and Jumhooree Party (JP) on February 27 held a 10,000-strong protest march calling for President Abdulla Yameen’s resignation. Since then, the MDP continued daily protests over the imprisonment of former President Mohamed Nasheed. The opposition leader was convicted of terrorism on March 13 and jailed for 13 years. Speaking to Minivan News, Ahmed ‘Andha’ Saleem, 37, said he was dismissed from STELCO on March 12 despite 17 years of service because of his political views. Saleem said his colleagues first told him to stop posting anti-government comments on social media or sharing photos of opposition protests. He complied, but was later told to resign when he was seen at an MDP protest on March 6. At the time, STELCO offered him a MVR 300,000 (US$19,455) retirement package, but he declined the offer. Soon afterwards, he received a letter informing him of his dismissal, he said. “I received a double promotion just three months back. This is an injustice. I will appeal this case at the Employment Tribunal,” he said. Ali Farhad, dismissed from STELCO on March 10, claimed the President’s Office was directly responsible for his dismissal. Several employees who attended the March 6 protests were asked to write apology letters to First Lady Fathimath Ibrahim or Tourism Minister Ahmed Adeeb, the 43-year old claimed. He was dismissed when he refused to write the letter. “I love STELCO. I have worked there for 30 years. Even though I’ve been dismissed and my fundamental rights violated, I will continue to participate in protests,” he said. STELCO’s Assistant Director Abdulla Nazir dismissed claims of forced resignation and said the four employees were retired voluntarily and afforded full retirement benefits. “The dismissals went according to company procedures,” he said. Condemning the dismissals, MDP Spokesperson and MP Imthiyaz Fahmy said the party would assist employees in contesting any unfair dismissal, suspension or incidents of harassment at the Employment Tribunal. “The government is ordering civil servants and state company employees to attend pro-government rallies, I have seen the texts, the letters ordering their attendance. Opposition supporters are getting sacked for exercising their right to assembly and free speech even as board members and managerial staff lead pro-government rallies,” he alleged. At MPL, a spokesperson said at least five workers had been suspended since March 1 for alleged misconduct. However, employees claimed 18 staff were suspended for participating in the February 27 mass rally. Administrative Officer Miusam Abbas said he received a letter on March 1 informing him he had been suspended for misconduct. He was summoned to a disciplinary committee last week and questioned on his participation in the February 27 rally, as well as his support for the government. Two additional MPL staffs who wished to remain anonymous confirmed they, too, had been suspended for their anti-government views and support for the opposition. “I don’t depend on Gayoom for my sustenance. I will continue protesting,” one 35-year-old told Minivan News. The pair confirmed MPL staff regularly received text messages from the company requesting their attendance at ruling Progressive Party of the Maldives rallies. Both said they had been summoned to a disciplinary committee and asked if they had gone to opposition protests. Attending protests calling for the president’s resignation while employed in a state-owned company was unacceptable, the pair were told. MPL Media Coordinator Ahmed Athif declined to comment on the suspensions, claiming it was an ongoing case. Meanwhile, a procurement assistant at MWSC, Ibrahim Ismail, 20, was dismissed on March 12 after he participated in a boat protest near Dhoonidhoo Island on March 6. “I knew this was bound to happen. Firing government employees who support the opposition has become common practice. But my dismissal came without warning, it was very sudden,” he said. The reasons for his dismissal remain unclear, Ismail said. The MWSC was not responding to calls at the time of press. A Sri Lankan Air Force flight is currently on its way to the Maldives from Singapore with custom built panels to replace the damaged panel boards connecting electricity generators and desalination plants at the Malé Water and Sewerage Company (MWSC). The capital Malé was plunged into crisis on Thursday (December 4) as a fire at MWSC gutted the desalination plant, leaving 130,000 people without running water, leading to the dwindling of bottled drinking water supplies. Defense Minister Mohamed Nazim said the two boards will arrive in Malé tonight. Of the nine panel boards, five were functional on Monday and MWSC had started releasing water to households in two three-hour periods in the morning and at night. However, residents living above the second floor of buildings have said they only receive water for a very short period of time. The MWSC has asked individuals to report issues with water leakages and booster pumps to send an SMS to 1050 with the client’s name and water meter number. Previously, the government rejected an offer by the Indian government to provide technical assistance in fixing the panels, saying it is seeking assistance from countries that are more technologically advanced. The crisis management fund – which has seen donations from several local corporations and foreigners – was set up by the government with an aim of collecting US$ 20 million (MVR 308 million) to repair the damages at the desalination plant and to fund relief efforts. Notable local businesses such as Champa Group and Universal enterprises donated US$ 100,000 to the fund, while an unnamed Saudi Arabian donor provided US$ 1 million. Telecomms company Ooredoo donated US$ 75,000 to the fund. Trans Maldivian Airways (TMA) and State Trading Organization (STO) have also donated funds. 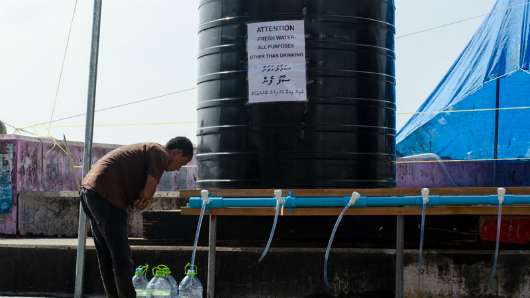 Anti-corruption NGO Transparency Maldives called on the government to display more transparency in order to avoid “economic and political repercussions stemming from the water crisis”. In a press statement, the NGO urged the government to provide a breakdown of the estimated US$ 20 million needed to overcome the crisis and how the government intends to spend it. “Furthermore, the decision to seek donations from the public raises questions given that MWSC ins a private profit-making corporation with 80 percent government shares,” said Transparency Maldives. An Indian flight is also due to arrive today with 50 tons of water while the INS Deepak supplied 400 tons of water straight to MWSC tanks on top of the 1250 supplied two days ago. Indian High Commission said today that the water relief operations resumed on the request of the Maldivian government. Opposition Maldivian Democratic Party (MDP) also criticized the fund stating that the government should only demand US$ 20 million after they have decided how it is going to be spent. “Where is the money going to go to? Why have we not seen a breakdown on how the money is going to be spent? 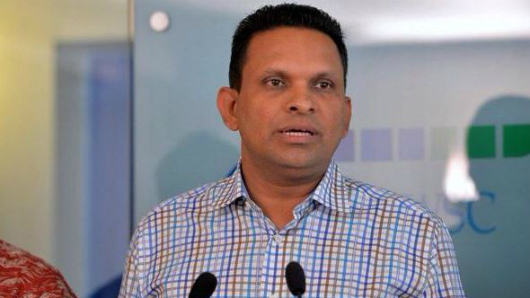 Will this be a new ring in the chain of corruption by the government?” questioned party Vice Chairperson Ali Niyaz. Former President and opposition leader Mohamed Nasheed has also called for an inquiry into the fire, suggesting that the Danish government previously recommended keeping 21 days of water reserves in the capital. Transparency Maldives noted that the crisis had demonstrated “the interminable relationship between good governance and citizens’ right to essential human needs,” and called for greater regulation of state-owned enterprises. With 130,000 citizens of the capital left without water, the government has said it could take up to two weeks to fully repair the damage. President Abdulla Yameen has said that there could have been no back up plan for a “disaster of this magnitude”. The United Nations in the Maldives has commended relief efforts during the Malé water crisis, though the opposition has attacked the governments preparedness and subsequent handling of events. In a press release today, the UN in Maldives commended the “outstanding response” of the government, noting that measures were also being taken to address the needs of vulnerable and special needs population. “The situation does not warrant any humanitarian assistance at the moment. UN is working with the Government to monitor closely that there will be no deterioration of the situation,” the statement continued. The President’s Office announced today that the closure of government offices would continue for the rest of the week, while offers of foreign assistance have continued to pour in. Meanwhile, the opposition Maldivian Democratic Party (MDP) condemned government efforts – in particular the decision to continue billing residents for water usage. “Water should be provided free of charge until the water crisis is resolved,” said Rozaina while speaking at an MDP press conference. Minister of Defense Colonel (retired) Mohamed Nazim said this morning that the Malé Water and Sewerage Company’s (MWSC) board of governors have decided to implement a 30 percent discount on water transactions for the month of December. Addressing the public for the first time during the crisis yesterday, President Abdulla Yameen noted that getting water supplies to the upper floors of buildings had been problematic. MWSC’s decision contradicts a company statement released two days ago (December 6) saying customers would not be charged until the current crisis is over in order to provide relief for the ground floor level residents who have been donating water. MWSC charges a progressive rate on the water usage, which rises as the usage increases over a MVR30 fixed monthly charge. The rate can go as high as MVR95 per cubic meter when usage increases over 500 liters. Nazim also revealed governments plans to set up a ‘Malé water crisis management fund’ to collect donations in order to recover the MVR300 million (US$20 million) spent on the management of the crisis. Rozaina criticised the estimated figure of US$20 million by saying that the MDP demanded a technical viewpoint on the damages and an explanation of why US$20 million is required for the repairs. The party has asked whether MWSC’s facilities were insured. An unnamed Saudi Arabian has already donated US$ 1 million to the fund while local business group Champa Brothers pledged to provide US$100,000. The MDP has also slammed the government’s failure to give a set date for the resumption of normal services, with members of the president’s task force telling local media yesterday that the issue could not be solved within a “politically desirable” timeframe. Continuing its extensive relief efforts, Indian navy fleet tanker INS Deepak arrived yesterday bringing with it 1,250 tons of water. The water was then pumped to tanks in Malé through 400 meters of pipe. The ship – which also has RO capabilities – is now at anchorage near Malé where it be producing 100 tons of water per day which will then be transported to the capital via barges. Indian High Commissioner to the Maldives, MR Rajeev Shahare – speaking aboard INS Deepak yesterday – said that the Indian government had offered technical assistance with the repairs which was refused by the government saying that they are consulting a Japanese firm. So far, 10 Indian military airplanes have landed at Ibrahim Nasir International Airport (INIA) bringing with them more than 200 tons of water. State Bank of India (SBI) also joined relief efforts today, distributing 7.5 tons of water. A Chinese vessel which arrived last night capable of producing 90 tons of water per day delivered 600 tons of water today to the capital. Two Chinese military flights landed last night with 40 tons of water in between them. A Bangladeshi military vessel with 5 desalination plants and one hundred tonnes of water is also due to arrive on Thursday (December 11). Meanwhile, President’s Office Spokesperson Ahmed Muaz announced today hat the government has decided to close all its offices in Malé for the rest of the week after considering the difficulties people could face as a result of the current water problems in Malé. Muaz noted said that the President’s Office will be open from 10 am to 1pm,while the Maldives Monetary Authority has also announced that it and other banks will be between 11am to 2pm to provide banking services for the public. Five days since the fire at Malé Water and Sewerage Company (MWSC) – the capital city’s sole provider of running water – disrupted water supplies, residents and local businesses struggle to make do with the limited resources available. As politicians begin finger-pointing, the inhabitants of the capital continue to cope with the crisis in any way they can. 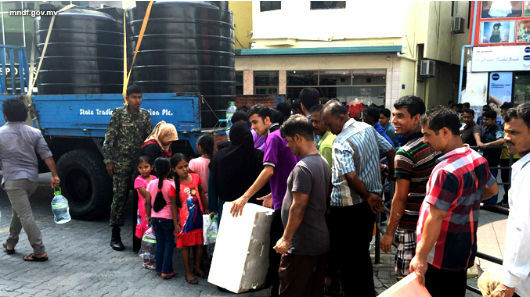 The Maldives National Defence Force (MNDF) and the Maldives Red Crescent have been distributing bottled water received as aid from neighbouring countries to citizens since December 5. The drinking water distributed by the MNDF in this manner is being transported to the capital city voluntarily from nearby islands by local businessman Adam Manik of Galolhu Sentuge, owner of Tug Service Marine Pvt Ltd.
Adam Manik has also taken the initiative to set up nearly a dozen large water tanks near the Water Jetty, where drinking water is dispensed free of charge. “I purchase the water, transport it to Male’ on my boats and distribute it for free to all and any citizens. I see this as a national effort and will continue to provide this service as long as the current water difficulties continue,” Adam Manik told Minivan News today. Adam stated that his employees have been working relentlessly for the past 4 days on all his boats. Three of his boats are being utilised for water transportation – ‘Adam 60’, which has the capacity to carry 200 metric tonnes of water, ‘Ifba’ carrying 60 metric tonnes and ‘Namoona’, carrying 20 metric tonnes. Meanwhile, Happy Market is currently producing ‘Life’ bottled water at maximum capacity, catering to the public, businesses, and resorts. Happy Market Purchases and Procurement Manager Akram stated that, while the company is unable to provide unlimited supplies, they are working to sell water at an equitable rate. Akram stated that other producers of bottled water are slowly resuming retail, which would stabilise the situation while taking some pressure off the sole seller of bottled water. While the queues at free distribution centres grow shorter, there are reports that many residents of Malé have chosen to travel to other islands, especially nearby Villingili and Hulhumalé – both of which have unaffected supply. Guest house owners confirm that all accomodation at these islands are now fully booked, while some guesthouses have started a new strategy of only renting rooms to Malé residents on an hourly basis. Traditionally, December is the time of the year when customary circumcision parties are held in the Maldives – which typically include a week long celebration after young boys undergo the procedure. Fathimath Waheeda stated that on December 4, she had to move her son from the hospital to Villingili as, due to the water shortage, she could not cater to the multitude of guests who would visit her son’s party. “I rented a room in Villingili and we are having the party here. Less people turn up, but at least there are no concerns of hygiene or catering here,” she said. Local businesses are also facing hardship due to the water troubles, with some opting to temporarily close down business until water services resume. Others continue to persevere, with many gathering water from distribution centres, or collecting water at the limited dispensing hours. Fahari Cafe’ – run at the North Harbour of Malé – said it is attempting to run business as usual, assigning one employee the task of going to queue at water distribution centres, while another stays alert to collect water during dispensing hours. Abdulla Saeed, owner of a food outlet called “Home Delivery” stated that they are following the same process. “What else can we do? This is the work we do to feed ourselves. We cannot give it up regardless of how difficult it may be,” he said. Marble Hotel owner Athif Saleem said that guests are aware of the crisis and that therefore very few complaints are received. “We are providing well water to the guestrooms and notifying them of the water supply dispension hours. We are also using rainwater in the cafe for washing purposes and services are available. However, we are getting fewer local customers in the cafe’ during this crisis,” he explained. Hair salons are also facing difficulties in providing normal services. Many claimed to be open only to offer a limited number of services – those which require a minimal amount of water usage. Cyza Salon also spoke of decreased number of customers during the crisis. “Like most others, we also bring water from the distribution centres. We aren’t getting too many customers these four days but if someone does come, we will try to provide services as best as we can”. According to Special Task Force member Minister of Home Affairs Umar Naseer, it will take upto 10 days or more for regular water supply services to resume. The Maldivian Democratic Party (MDP) has called on the government to hand over power to Jumhooree Party (JP) leader Gasim Ibrahim in light of recent events. At the party’s emergency national council meeting, the council agreed to support a decree brought forward by former president Mohamed Nasheed urging the government changeover. While presenting the decree to the members of the national council, Nasheed said that the government had failed in ensuring basic necessities for the people of the country and that President Abdulla Yameen should handover the government to Gasim since he was able to secure almost the same amount of votes in the first round of the 2013 presidential elections. Gasim polled third twice in last year’s presidential elections – successfully requesting the first vote be annulled before again finishing behind Yameen and Nasheed in a rescheduled poll. Gasim eventually threw his support behind Yameen, forming a coalition that saw the latter win the presidency before relations soured earlier this year. Nasheed highlighted the lack of a presidential response during the ongoing Malé water crisis saying that the president was nowhere to be seen. As the MDP council was meeting, President Yameen briefed the public for the first time on the water crisis. “I would like to respond by saying that the shares of this country was sold to foreigners. I raised my voice against this as a member of the parliament. The question of handing governance will come when the presidential seat is empty,” said Yameen. The former president also noted the growing insecurity amongst citizens, with an increase in gang violence, while saying that the government has done very little to curb these crimes. “There has been 7 murders so far this year. While there has been overall 20 stabbing incidents there has also been cases of 6 people taken as hostages,” detailed Nasheed. The early hours of this morning saw the most recent death in gang-related violence with a 28-year-old man being stabbed to death by group of men. Police have denied any arrests related to the death although local media report that 10 men have been arrested related to the violence. While discussing the decree before voting, MDP Rozaina Adam said that it is unclear who is really in charge of the government at the moment and that the president should step down if he is unable to fulfill his presidential duties. President Abdulla Yameen will cut short his personal trip to Malaysia and return to the Maldives as the Malé water crisis continues into its third day. Speaking to the press, President’s Office spokesperson Ibrahim Muaz said Yameen is expected to return tonight (December 6), cutting short his visit to Malaysia, where his son is said to be receiving medical treatment. In Malé, Minister of Defence Colonel (retired) Mohamed Nazim has said that damage to the capital’s desalination plant is extensive, and could take between three days and a week to fully repair. Water services to the capital Malé have been shut off after a crippling fire damaged crucial components of the island’s sole desalination facility – the Malé Water and Sewerages Company (MWSC) – leaving over 130,000 people without water for bathing, cleaning, and cooking. “We hope to achieve 100 percent in about a week. God willing, we will be able to get a good result in about three days,” said Nazim, speaking on behalf of a presidential task force. While 60 percent of the repairs have been completed, he continued, the fire had caused considerable damage to the water treatment plants, requiring extensive repairs. “The damage to the water treatment plants’ panel board was a lot more than we had expected. Since the spare parts are not available in the Maldives, we must wait until we can acquire it,” said Nazim. Fresh supplies of water continue to arrive from abroad – most notably from India – with distribution being carried out by the Maldives National Defence Force (MNDF) with the assistance of local NGOs alongside numerous private businesses. The government has set up water distribution centers at schools and other public spaces, with each person allowed two 1.5 litre bottles, leading to the formation of large queues stretching around the capital. Local IT enthusiasts have developed a mobile app to enable residents to locate nearby distribution centres. In addition, water is being pumped every six hours by MWSC for one hour periods although low water pressure means that many of the capital’s residents living in high rise apartments have received no supplies. 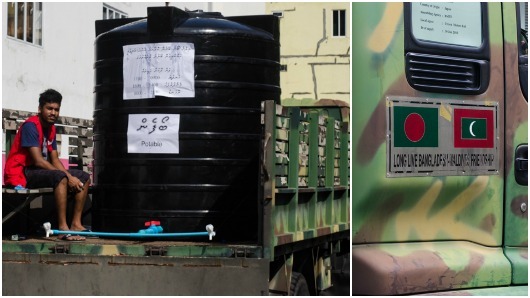 The MNDF has started distributing water through mobile tanks set up on military vehicles at various locations of the city, temporarily easing the queues at the water distribution centers. President Yameen has declared today that all government offices will be closed on Sunday and Monday (December 7 and 8 ) as a result of the crisis, while calling on the public to remain calm and cooperative. 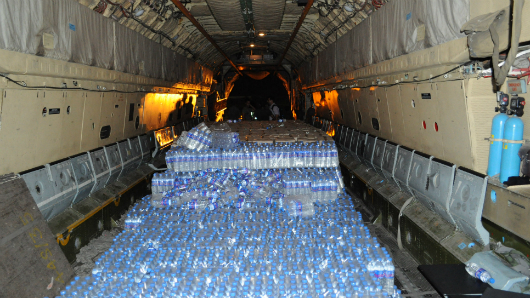 Meanwhile, the government of India continues to send supplies, having delivered over 150 tonnes of water via military aircraft in the past 24 hours. A second Indian vessel, with reverse osmosis facilities capable of delivering 200 tonnes of water daily, is expected to arrive today with 800 tonnes of water. The Chinese government has sent 12 tonnes of water aboard a Mega Maldives flight from Beijing, with the foreign ministry also reporting Chinese naval vessels being en route to the capital. 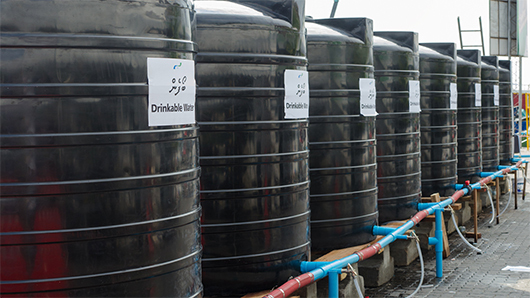 Yesterday, Sri Lanka started sending water to the Maldives via Sri Lankan Airlines flights, while the UN in Maldives has said it will distribute 180 tonnes of rainwater stored under its premises on Buruzu Magu. 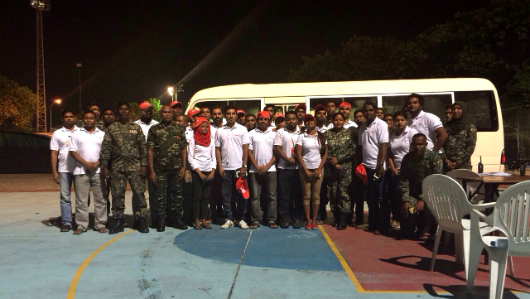 The Maldives Red Crescent (MRC) and teams of volunteers from telecoms provider Ooredoo have been been assisting security services, with Head of Planning Shabeen Ali telling Minivan News that people waiting for water have been “very calm and disciplined”. Detailing efforts, MRC spokesperson Safa Musthafa explained that the MRC has mobilised more than 450 volunteers, requesting more people to join the distribution teams by reporting to Majeedhihyaa school which is operating as the organisation’s headquarters. Safa also revealed that 5 tonnes of bottled water would be shipped tomorrow under the disaster and emergency relief fund set up by the International Federation of Red Cross and Red Crescent Societies. Meanwhile, the Human Rights Commission of the Maldives (HRCM) has commended the state’s quick response to the water crisis, though it noted concern over reports of discrimination against migrant workers. Human rights and pro-democracy NGO Maldivian Democracy Network (MDN) also voiced concern over reported discrimination, though volunteers at distribution centres have said the government has reversed the initial requirement of an official ID to collect water. Rumours of discrimination against migrant workers have circulated on social media with some members of the public telling Minivan News of a fight breaking out at Galolhu stadium last night after locals demanded priority over migrant workers in the queue. MDN also raised concerns over the absence of a backup plan, urging authorities “to take lessons from this incident and come up with a backup plan for Malé and other islands”. Former President Nasheed has called for an immediate inquiry into the causes of the crisis, questioning the government’s preparedness levels as well as President Yameen’s absence from the country. Malé City Council – originally mandated with the provision of water services under the 2010 Decentralisation Act – has also raised the issue of responsibility for the crisis. A council statement noted that its offer of assistance had been rejected by the government’s task force. The BBC reports ‘Maldives in Water Crisis’, while a number of outlets, including the Daily Mail and Al Jazeera, have chosen to focus on the small number of isolated incidents involving violence. Government minister Mohamed Shareef was quoted by Reuters as saying that a state of emergency has been declared – soon picked up by the AFP – though this has subsequently been denied by the foreign ministry. The Diplomat noted that the crisis represented an opportunity for India to demonstrate its capacity as “first responder” in time of crisis, as well as suggesting that a prolonged period without water might lead to “grave economic consequences and a broader political crisis”. In Indian media, the New Indian Express ran the headline ‘IAF Airlifts Water Bottles to Quench Maldives’ Thirst’, while the Hindu has led with ‘How India staved off Maldives’ water crisis’. Former President Mohamed Nasheed has called for an inquiry into the fire at the Malé Water and Sewerage Company (MWSC) on Thursday (December 4) that caused the capital’s ongoing water supply crisis. “We absolutely need an inquiry, an investigation, right now [in order to find out] how this happened,” the opposition leader said at a Maldivian Democratic Party (MDP) rally in Haa Alif Dhidhoo last night. The public should be duly informed about the efforts of the ministerial task force formed by President Abdulla Yameen to resolve the crisis and given a date for resumption of water supply services, he added. The MWSC cut off water supply in Malé after underground cables connecting the switch room and generator caught fire, causing damage to the reverse osmosis plant used to produce desalinated water. Nasheed said the Danish government had advised MWSC to keep 21-days worth of water supply in reserve after completing a project to provide water to Malé. The water crisis was caused by President Yameen appointing “thug activists” to the MWSC after dismissing experienced and qualified staff at the company, Nasheed contended. The MDP government had a plan to deal with similar situations as well as natural disasters, Nasheed said, asserting that the crisis would have been resolved in 24 hours under his administration. Of the 2 meters of annual rainfall in the capital, Nasheed observed that less than half was collected for use. He went on to express gratitude to police and military officers for their efforts in assisting residents of the capital as well as the Indian government for promptly responding to pleas for assistance. Referring to reports of foreigners denied water at collection points, Nasheed called on President Yameen to apologise to expatriates residing in the capital. President Yameen’s “biggest failure” was his administration’s foreign policy, he continued, which he said should not be biased in favour of any particular country. Nasheed also repeated his criticism of President Yameen “ruling in absentia” and called on the president to disclose his alleged health problems to the public. Briefing the press this morning, Defence Minister Colonel (Retired) Mohamed Nazim urged the opposition to refrain from “politicising” the crisis. The Maldives Police Service has meanwhile launched an investigation into the fire incident at MWSC. Commissioner of Police Hussain Waheed has reportedly tasked a special team with the investigation.